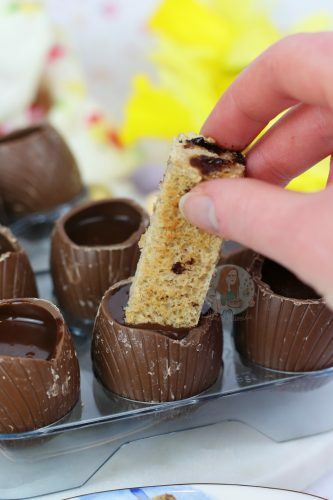 Gooey, Rich, Chocolate Dippy Eggs with Hot Cross Bun Fingers! Honestly when this idea was discussed with some gals from Cosmopolitan Magazine, I was like OH YES PLEASE because my gosh this is my idea of heaven. I kid you not, I devoured these the first time I tested them out, and then when I was making them again to take photos, it was so hard to not eat them quickly again! 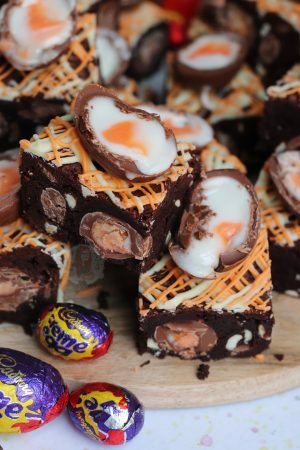 These are much easier to make than they might sound to some people but OH MYYYY hello. 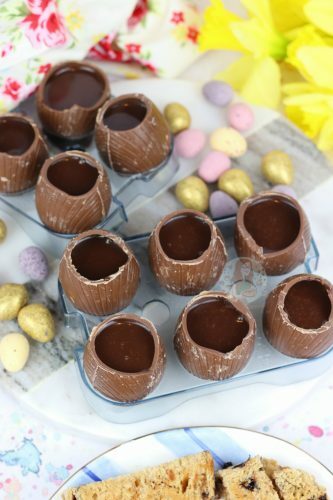 A pre-bought chocolate shell because I am super lazy, and they’re cheap, and then an incredibly easy chocolate sauce mixture for dipping. YES. You can easily make these into a delicious creamy yoghurt in a way by setting the sauce liquid, and its so indulgent. It’s like those mini Gü pots you can buy that are just so delectable. However, these are homemade so are better. I was doubting what this could taste like, and how runny it might be and such… but I kid you not its perfect. You just have to have faith and more importantly PATIENCE so that you don’t melt your shells. I might have had an accident on the first test batch because I was testing the heat and well yeah… melty mess. I waited for my chocolate sauce mixture to get to a cool temperature, where you can easily dip your finger in without getting burnt, and its basically cold. Obviously, you don’t want it to set though so make sure you give it a stir every now and again! And also cover it so it doesn’t form a skin. Pouring it in is simple, but make sure you don’t have any hidden cracks in your egg shells because that also made a bit of a mess for me. One of the shells at the back of this photo was cracked through the entire little photoshoot and it was suuuuuccchhhhh a mess to clean up! 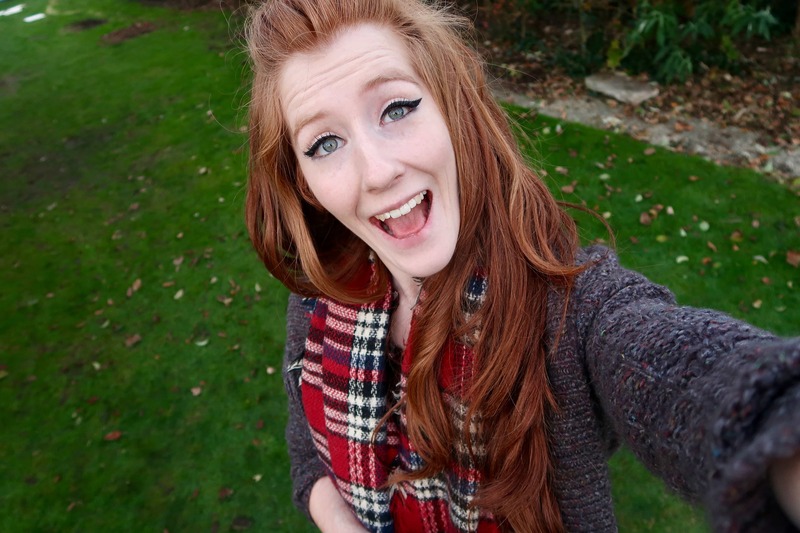 Nearly made a brown stain on my back drops! 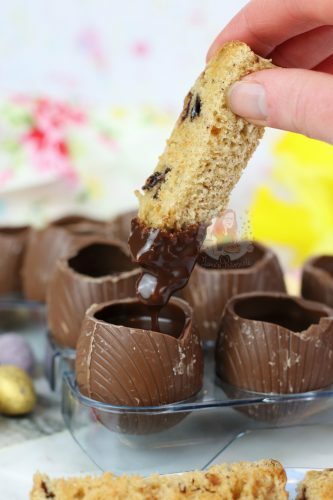 Someone suggested dipping Hot Cross Bun fingers into these rather than regular toast fingers to make it even more Easter themed and I think it was the best thing to have happened ever. 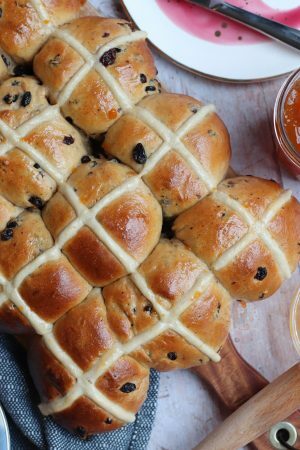 I do eat a lot of Hot Cross buns year round (As they’re one of my favourite treats ever) but the Easter special flavours that crop up around this time of year are always a dream. Last year Marks & Spencers did a chocolate and fudge hot cross bun which was seriously yum, but they’ve out done themselves this year with their new Salted Caramel and Chocolate ones. I kid you not, I have eaten FAR TOO MANY THIS YEAR. Break up your Dark Chocolate and Milk Chocolate into small pieces, and add to a heavy based saucepan. Add in your Double Cream, Whole Milk, Golden Syrup and Vanilla and heat it together on a low-medium heat, stirring regularly. Once melted, let the mixture cool. Whisk every now and again to prevent a skin forming. While the mixture is cooling, carefully cut the tops off the mini Chocolate Egg Shells. I use a sharp small knife and carefully cut them off, preventing the shell from cracking. 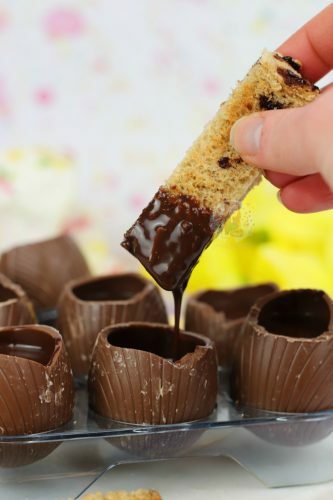 Once the chocolate dippy mixture is cooled, pour carefully into the shells. Make sure the shells are supported enough so they don't fall over! 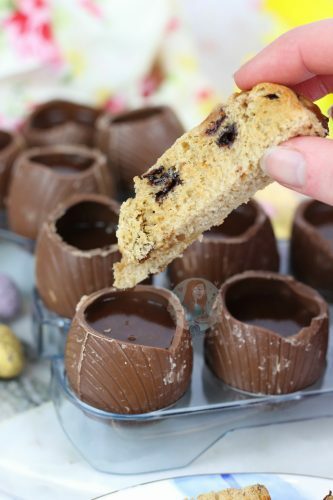 Toast some Hot Cross Buns and cut into fingers - dip into the shells and enjoy a gooey chocolate DELICIOUS treat! 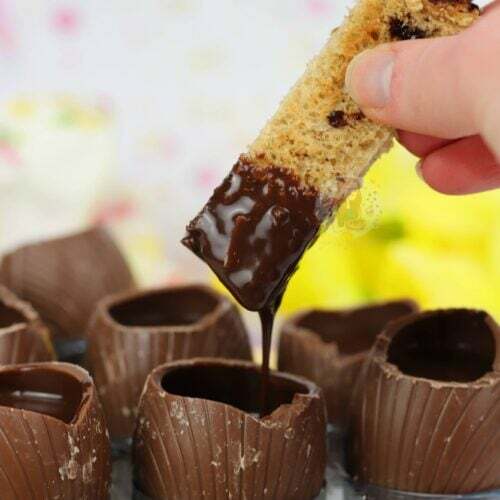 You really do need to make sure that the chocolate sauce mixture has cooled otherwise (obviously) it will melt the chocolate eggs and you'll have a chocolatey sticky mess. 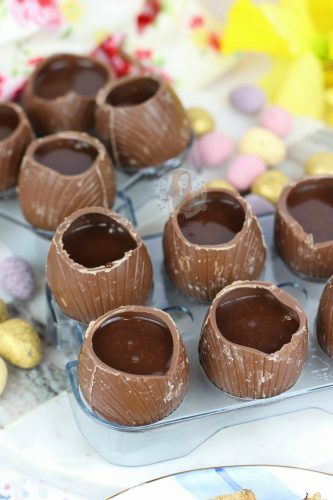 I used some supermarket own chocolate shells which nearly every supermarket sell at Easter time these days. I 1000000% recommend using the Salted Caramel and Chocolate Hot Cross Buns from Marks & Spencers for the dipping as its chocolate delicious overload! These will last for 1-2days after making! 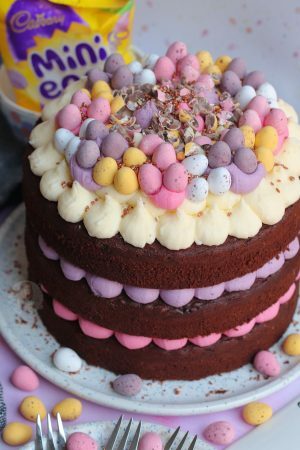 Find my other Easter Recipes on my Recipes Page! Older Next post: Billionaires Tart! 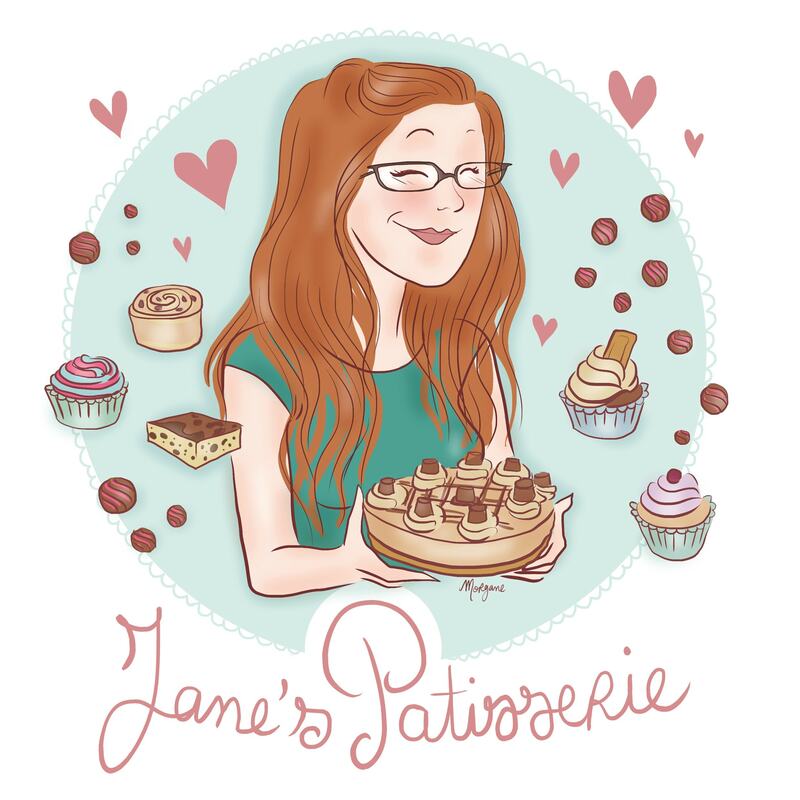 Newer Previous post: Cadbury’s Caramel Cheesecake!